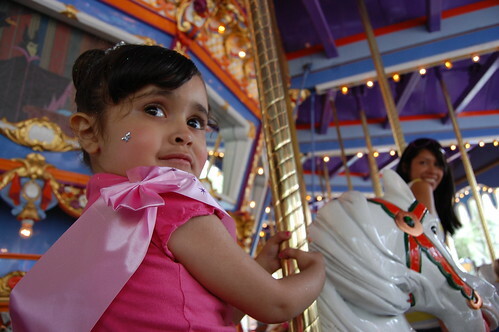 The Phi's first request was that we go on the carousel. Awesome, no waiting! We hoped on, went around in circles and hopped off. The Phi loved it. Next she requested the Dumbo ride and since Tia Uh-laine is a sucker, I mean an awesome Tia she got on with her. 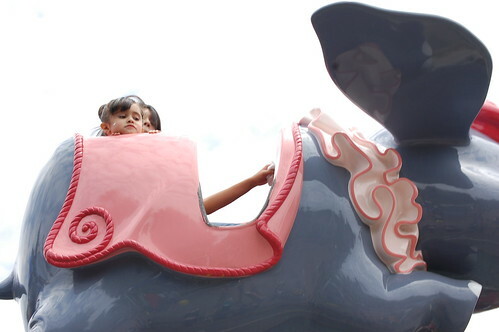 And this time she got to ride in the coveted pink Dumbo. Apparently my kid does not have the normal fear of heights like normal people and spent the entire ride with her head hanging over the side. 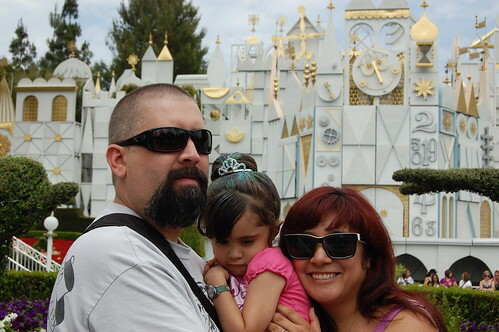 Then we headed over to the newly remodeled It's a Small World. 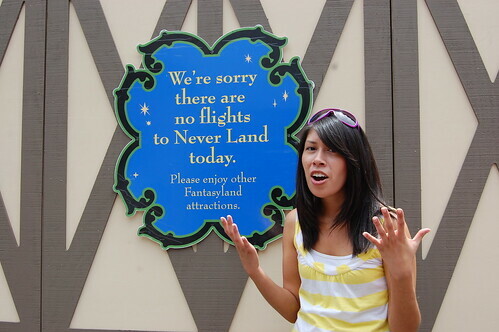 And it was still the ride that you remember but they have added disney characters all small world-ized in their appropriate lands. Like you can find Alice and the White Rabbit in London and Lilo and Stitch in Hawaii. Very cute. 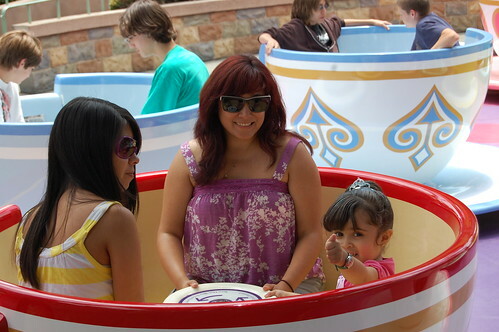 Then it was time for the tea cups. The Phi loves herself some spinny rides. PR Dad does not. Tia Uh-laine and I got on with her and she yelled almost the entire time. Yelled in the good kind of way. Apparently Uh-laine and I did not really get the concept of a picture spot. 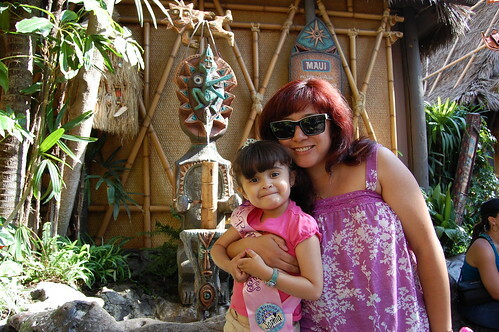 Then it was time for the Tiki Room. Another new experience for The Phi. She was hesitant to go but we kept telling her that she had to go because it was Tata's favorite and he would want to hear all about it. Plus the whipped pineapple sorbet we enjoyed before the show also helped in convincing. The sorbet gave us some great ideas for mixed drinks for our camping trip. Someone bring a battery operated blender okay? After the Tiki Tiki Tiki Tiki Tiki Room I noticed that next door where the Aladdin stage show happens there were a few people in line. 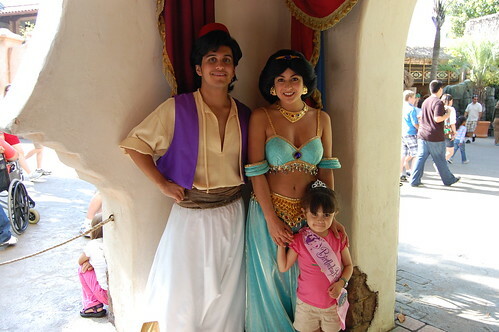 I looked over and noticed that Jasmine and Aladdin were there signing autographs and taking pictures. 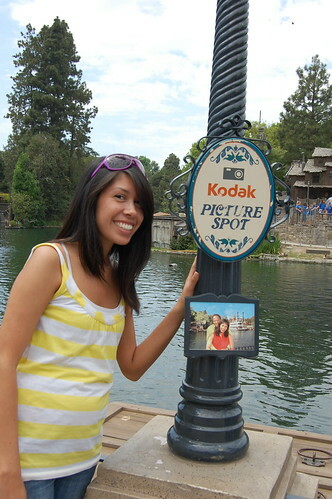 Last time we went to Disneyland The Phi was too shy to go up to Jasmine when we saw her. So I grabbed The Phi and headed over to get in line. Leaving the rest of my party in utter confusion, but they are a smart bunch and figured out where we were and what we were doing. As we waited The Phi kept telling me that I was going to have to carry her to meet Jasmine. It was our turn and before I could even pick up The Phi, Jasmine said, "well hello birthday princess" in that freaky princessy voice little girls love. (The Phi's sash was a total give away.) And The Phi walked right over to her. Shook her hand and posed for a picture. Look for part 3 of our trip tomorrow! Ah! The Tea cups? Did she by chance pick the Purple one? That is my favorite. I am truly envious of the Phi. My Birthday is next week,I wonder if they can Princess-ize an old lady.